Justin has been leading his clients for over two decades. He has served with just one mission: to create lifelong and impactful relationships by adding value. Justin joined A.G. Edwards in 2001 in Flagstaff, Arizona before relocating his practice to Fort Collins, Colorado in 2005. 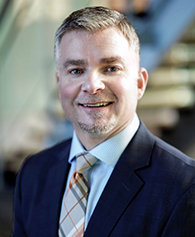 Justin completed his undergraduate work in Psychology and Criminal Justice at Northern Arizona University in 1997 and received his MBA from Colorado State University in Fort Collins in 2013. Additionally, Justin received his CFP® designation in 2007. Justin is a repeat speaker and participant in several top industry conferences. Justin’s team specializes in three disciplines: closely held business strategy and liquidity planning, estate planning, and retirement income strategies. It is the intersection of these three concentrations where Justin’s education, experience and credentials have had the most meaningful impact for his clients, their families, and the broader communities they share. Justin’s desire to shape a brand that has become a recognized and respected philanthropic partner in Northern Colorado is evidenced by the giving, volunteering, and involvement that permeate a culture committed to making a positive community impact. Justin takes an active and leadership role in several non-profits. He serves not only in an advisory capacity, or as a board member, but also as an advisor, mentor and advocate for the next generation of philanthropic giving and community involvement. Personally, Justin’s inspiration and joy comes when collecting experiences of any kind. Travelling is his favorite pastime, which he enthusiastically attacks as often as he can with his bride Stephanie. They also spend a significant amount of time supporting local causes, the performing arts, and attending CSU football games. Throughout the year, he also enjoys snowboarding, whitewater rafting, scuba diving, Spartan races and anything outdoors. After almost 19 years with the same firm, Justin and his team felt that the culture and pressures of affiliation with a bank owned entity was no longer in his clients’ or his team’s best interest. The flexibility of independence, building a reputable brand, and being able to offer an enhanced client experience was enough to trigger a transition in early 2019. Justin is an entrepreneur, works with successful entrepreneurs, and his affiliation with Raymond James has allowed him to fulfill that long burning passion to create something that can truly have a lasting IMPACT on all those that he cares about most.